Some conservatives have defended the Trump administration’s decision to separate children from parents who illegally crossed the US-Mexico border. Republicans are shifting the blame to Democrats, despite the policy being discretionary. WASHINGTON – A handful of conservatives are backing President Donald Trump’s decision to have families of undocumented immigrants separated at the US-Mexico border, while many others are falsely claiming the policy is a concrete law put in place by Democrats. There is not any law on the books that mandates children be separated from their parents if the family is caught crossing the border illegally. The policy is a purely discretionary one, which the Trump administration is choosing to enforce. While some Republicans have condemned the practice as abhorrent and cruel, others have taken a different approach. The Family Research Council, a conservative activist organisation whose annual gathering Trump has spoken at, is backing the policy as necessary. FRC President Tony Perkins wrote on the group’s blog on Friday that the separation of families is the fault of the immigrants, not the Trump administration’s. Perkins compared the administration’s practices to Child Protective Services, which will often remove kids from dangerous or abusive homes. Administration officials shifted blame to Democrats. White House deputy press secretary Hogan Gidley said on Fox News’s “Fox and Friends” Monday morning that “this is all the Democrats’ doing. “This is up to the Democrats, they could fix this right now,” Gidley said. 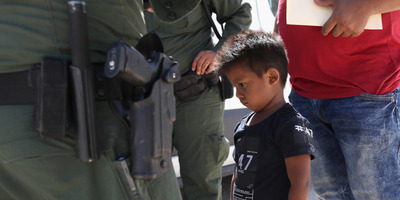 And conservative media outlets have downplayed the separations and conditions of children being held at facilities once apprehended. House Speaker Paul Ryan punted on the issue, saying in a press conference on Thursday that it “ought to be addressed” in upcoming legislation, despite the fact that the Trump administration could reverse course at any time. Few Republicans have spoken out against the separations by accurately addressing the circumstances. Sen. Ben Sasse of Nebraska broke with the Trump administration on Monday in a lengthy Facebook post.